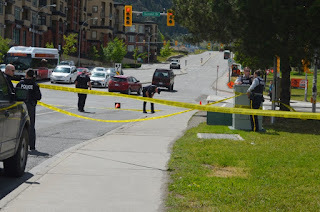 Kamloops this Week is reporting that "Kamloops Mounties say they have found both vehicles linked to a shooting in Sahali on Monday, but added no arrests have been made. Police were looking for suspects in the shooting, which took place at a busy intersection near Thompson Rivers University at 1:25 pm. Shelkie said police were told a person in a vehicle had shot a firearm at someone in another vehicle near the intersection of McGill Road and Summit Drive." "Shelkie said the suspect vehicle is described as a black pickup Escalade with an Alberta licence plate. She said there appeared to be two people in the vehicle, both wearing bandanas over their faces. The victim shot at was in a small silver car, which had one or more of its windows damaged by the gunfire." Konaam Shirzad was shot dead in Kamloops September 2017. Konaam was a cofounder of the Red Scorpions back when it used to work for the UN before the Surrey Six when it was taken over by the Hells Angels. Sources clam that although Konaam had left the life, he kicked the Cub Pack out of Kamloops which provided a motive for the shooting.